Do Muslims worship Prophet Muhammad? It has been postulated by some Christian Evangelists that most Muslims commit polytheism in their formal or ritual prayers during the recitation of what is commonly known as at-Tashahhud due to the sentence: As-Salāmu `Alayka 'Ayyuhā An-Nabīyu Wa Raĥmatu Allāhi Wa Barakātuhu [Peace, mercy and blessings of Allah be on you, O Prophet.] The claim is that the Prophet is being addressed as if he is omnipresent. However, this is not necessarily the case. Which can be clearly seen in the full context of the at-Tashahhud where all worship is due to God alone and in the testimony of there is no deity except God and [thereafter] in asking God to send blessings upon the Prophet as God sent blessing to Abraham (peace be upon him) – this is clearly a supplication addressed to God alone. Moreover, in every language, literary devices are used to produce a specific affect, perhaps, in this case, the affinity between the Prophet of God and the believers – developing a more sincere supplication for God's peace, mercy and blessing to be upon the Prophet. The addressing of the Prophet in at-Tashahhud is an example of what is known as Apostrophe in the literary device, i.e. when a speaker breaks off from addressing one party and instead addresses the third party. This third party may be an individual, either present or absent in the scene. It can also be an inanimate object or an abstract concept. The apostrophe is a figurative language which is contextually evident. We used to say the greeting [peace], name and greet [peace] each other in the prayer. 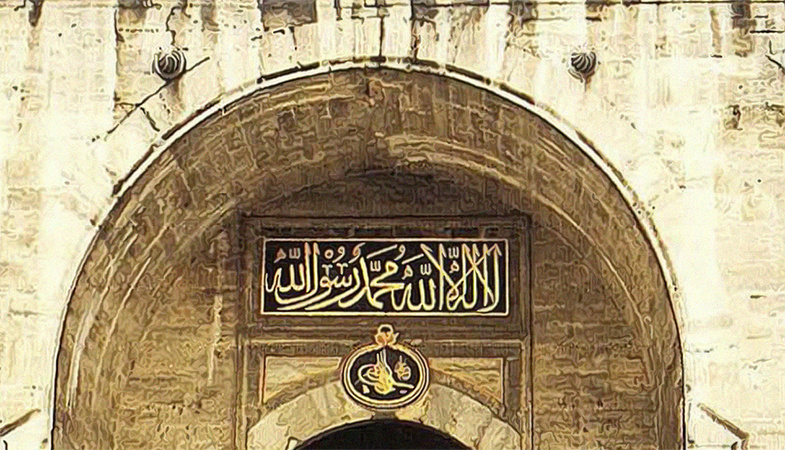 Allah's Messenger (saw) heard it and said:--"Say, 'at-tahiyyatu lil-lahi was-salawatu wat-taiyibatu . Assalamu 'Alaika aiyuha-n-Nabiyu warahmatu- l-lahi wa-barakatuhu. _ Assalamu alaina wa-'ala 'ibadi-l-lahi as-salihin. Ashhadu an la ilaha illa-l-lah wa ashhadu anna Muhammadan `Abdu hu wa Rasuluh. So, when you have said this, then you have surely sent the greetings to every good (pious) worshipper of Allah, whether he be in the Heaven or on the Earth.” Ascribed to Bukhari. Whether this ‘at-Tashahhud' is certified by the Prophet (peace be upon him) in the first place is a matter of one's faith in the sciences based upon ‘secondary sources'. Nevertheless, without doubt, Muslims who recite the conventional ‘at-Tashahhud' are not committing polytheism [Arabic: shirk] due to it, in their ritual prayers. It is further asserted (again by some Christian Evangelists) that Muslims worship the personage of Muhammad (peace be upon him) due to their supposedly wholehearted obedience to him. However, God in the Quran does not endorse this at all. What is expected of the Muslims is to obey Muhammad in his capacity as a Messenger of God (peace be upon him) and not as a mere mortal. There is not a single verse in Quran commanding obedience to the personage of Muhammad outside his capacity of being a Messenger of God. Rather, there are plenty of verses commanding the obedience to the Messenger – where the message of God and messenger of God are inseparable in the sense that the source of obedience is one, God Almighty. A contention may be raised so why not just say obey God alone. Had that been the case those who already believed in God would have claimed they already do (yet they associated deities with God). Thus, Muslims who obey [and follow God’s message transmitted by] the messenger (of God) are not committing polytheism at all. Alas, a few hardliners who endeavour to follow the message of God as conveyed in the Quran, claim that the traditional testimony of Muslims La ilaaha ill Allah Muhammad Rasool Allah (There is no deity except God, Muhammad is the Messenger of God) is a statement of polytheism due to the mere fact the name Muhammad is mention besides Allah. The ludicrous nature of this claim is self-evident. Incidentally the verse 48:29 commence with the phrase Muhammadu-rasoolu-llaah (Muhammad is the messenger of God). Nevertheless, if there are 'Muslims' who deify or worship Prophet Muhammad (peace be upon him) it is from their own doing and not warranted by Almighty God, and of which messenger Muhammad (peace be upon him) is innocent. If a Muslim died in the state of polytheism, then God has made it clear in His Glorious Quran that this abomination of associating, worshipping, invoking or deification of other deities with the Lord – the Mighty and Majestic-, is unforgivable in the Hereafter. As is Quran 3.132, 4.69, 8.20, 24.54, and etc. Quran 10.31, 3.60, 12.106 and etc. If you commit polytheism, all your works will be rendered vain, and you will be among the losers. Therefore, you should worship Allah Alone, and be among His grateful servants. Whoever commits polytheism, Allah shall forbid for him Paradise, and Hell shall be his abode. And for such wrongdoers, there will be no one to help.